I just came back from the west coast where I tried dungeness crab for the first time. I’ve daydreamed about the complex yet sweet flavor ever since, and snatched it up when I saw it at the seafood counter. The fishmonger kindly cleaned my crab for me, but excellent instructions on how to breakdown, clean and cook your crab can be found here. Claw or lump will work just fine if you can’t find dungeness, but having the whole crab – with the shell – allows you to make stock. Simply boil the cleaned shell of for 20 minutes with some salt and pepper and seasonings of your choice. 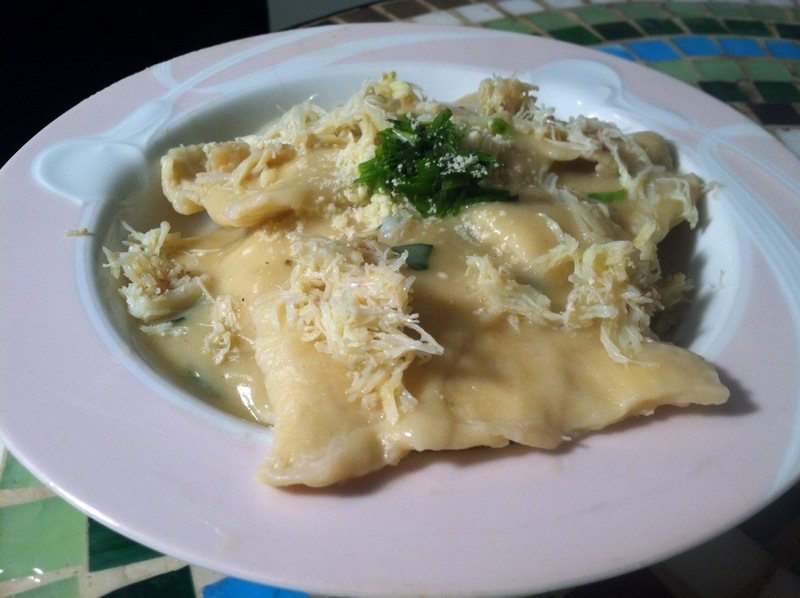 This recipe is not for the faint of heart, so if you’re understandably not up to making pasta, just toss the crab mixture with pre-made ravioli for a delectable meal. But if you’re willing to go to the distance, you won’t be sorry. 1. In a medium bowl, combine flour and salt. Make a well, then add the eggs. Using a rubber spatula, fold the ingredients together to form a stiff clump. Add water, in tablespoon increments, if necessary. If the dough gets too wet, sprinkle in more flour. 2. Dump the dough onto a lightly floured surface and knead (with wet hands!) for a minute or two, then roll out as thin as possible into a symmetrical(ish) shape. Cut the dough in half, then store in the fridge until the filling is ready. 3. In another bowl, toss the 1 cup of the crab meat with the egg, cheese and lemon juice. Season with salt, pepper and dried dill. 4. Put a large pot of salted water on the stovetop, and assemble raviolis while water is heating. Layer pasta sheets on top of each other, and cut into 1 1/2″ squares. Spoon a little less than a tablespoon of filling into the center of half of the squares, then top with another pasta square. Dip your fingers in egg wash or water, and pinch edges together to seal. 5. When raviolis are assembled – you should have a dozen or so – gently lower into simmering water. Increase the heat a teensy bit, then let boil til the raviolis rise to top – about 5 minutes. Remove from pot with slotted spoon. 6. While the raviolis are cooking, quickly make the sauce. In a large pan, heat a drizzle of olive oil and sauté shallots and chard. When chard is wilted and shallots are soft, remove from pan and set aside. In the same pan, melt the butter then whisk in flour. When all clumps are dissolved, whisk in the stock and stir til creamy. Remove from heat. 7. To serve, mound chard in a bowl, then arrange ravioli on top. Spoon on sauce, then garnish with chives, parmesan and remaining crab.